A new animation titled Dripped describes itself as an homage to Jackson Pollock, but the gorgeous, silent film is truly an about literally feeding our creative urges in hopes of developing an artistic identity. 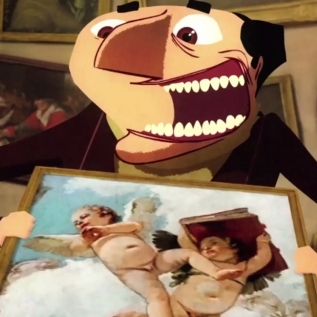 The eight-minute short follows the story of Pollock-like art thief who takes big 'ol bites out of the iconic artwork he steals, which morphs him into a Cubist creature, a Renaissance-style cherub, and other surreal painting-humanoids as if he had Jean Grey-like powers. The more the character consumes, the less satisfied he feels. He eats van Goghs, Picassos, and more, eventually devouring his entire stolen collection and feeling emptier than ever. That is, until he discovers his own drip painting style. Directed by Léo Verrier and produced by ChezEddy, Dripped is one of the most entertaining odes to creative inspiration you'll watch all week. Take a taste of the animated adventure above—it won't leave you hungry.